In Sydney we are celebrating the first direct radio message from England to Australia on 22nd September, 2018 . We call it 'Wales to Wahroonga'. We will activate a special callsign on that day VK 100 MARCONI and will have it for one month. I am hoping to set up a small ALARA table in the display room. In the Northern Welsh town of Waunfawr on a cool and overcast night, the Australian Prime Minister William Morris Hughes outlined a message for Senatore Guglielmo Marconi to send to Australia by wireless. It was Sunday 22nd September 1918 and the Prime Minister had just returned from the battlefields in Europe. This was to be the first direct wireless message sent from the United Kingdom to Australia and the recipient was Mr Ernest Thomas Fisk who had an experimental wireless station in the attic of “Lucania“; his residence in Wahroonga. (northern suburbs of Sydney) Since that historic day, a monument has been erected, unveiled in December 1935, when the former Prime Minister, Mr ‘Billy’ Hughes, addressed the assembly and Marchese Marconi also spoke by wireless from Paris in France. The Marconi-Fisk achievement is commemorated by a monument located outside the original receiving site in Wahroonga (Australia), which is still a private residence. Every five years the Hornsby Amateur Radio Club (HADARC) and the Ku-ring-gai Historical Society have commemorated the event by the exchange of wireless messages with the Dragon Amateur Radio Club in Wales (UK). 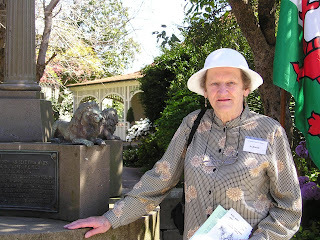 The Dragon Radio Club will also be operating an HF station from the Welsh site of the Marconi transmitter using the special event amateur call sign GB2VK, and it is proposed that Fiskville, located in Victoria (Australia) and named after Ernest Fisk (where early transmitters were located), will be activated from Werribee Gorge State Park (VKFF-0775). CONGRATULATIONS TO ALL THE WINNERS & THANKS FOR YOUR PARTICIPATION! 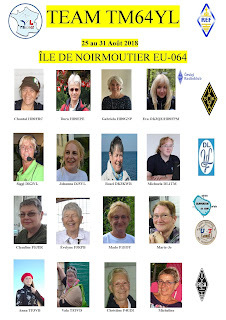 From 25-31 August activation of EU-64 Island of NOIRMOUTIER with the spécial call TM64 YL. Maren wrote 12 Sep 2018 - enclosed you will find the RNARS Newsletter. Please have a look on page 11-15. I did not know how Joe G3ZDF would put the information in the newsletter. 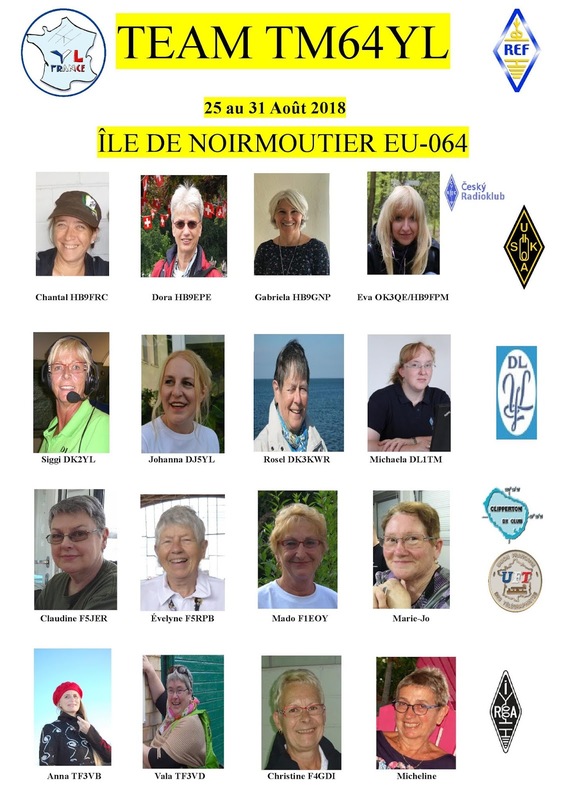 -Maren Lorentz (DK9MOS) tells us about various activities by Yls and is herself attached to U99 (DL0DMB) Museum Group where they keep the radio room active. p12 - Koko Myoshi "Mio" (JR3MVF), YL's active in Bhutan as "A52YL Group. Augusta Ada King, (10 Dec. 1815 - 27 Nov. 1852) born Augusta Ada Byron, the only legitimate child of the poet Lord Byron; the Countess of Lovelace now commonly known as Ada Lovelace. An English mathematician and writer she was one of the world’s first computer programmers, and one of the first people to see computers as more than just a machine for doing sums. In 1842 she wrote what is now recognized as the first computer programmes. The programme was written to calculate Bernoulli Numbers for Charles Babbage’s Analytical Engine, a general-purpose computing machine - that was never built! Lovelace was way ahead of the time; she not only understood how Babbage’s machine could carry out complex computations, she also imagined that, given the right inputs it could make music or graphics. Ada Lovelace's work went widely unrecognized until the 1950s, when her papers were republished, and their significance and her contributions to the fields of computer science and mathematics were finally acknowledged. In the 1980s, to honor the contributions of Lovelace, the Department of Defense (US) named its newly created computer language ‘‘Ada’’ after her. Ada is still in use today. The language spec has been updated and modernized several times, most recently in 2012. It’s deemed a must in many defense-related systems where reliability and safety are critical, or where thousands of programmers may work on a single code base. NASA’s CubeSat project launched a dozen satellites built at universities into orbit in 2013. Carl Brandon, a physics professor at Vermont Tech, says, “The Vermont CubeSat is the only university CubeSat that successfully completed its mission: eight were never heard from, one fried its batteries the first day (software error), one worked a little for less than a week, and one for four months.” Vermont Tech had used SPARK, a language based on the Ada spec, for their flight software. Their Lunar IceCube, scheduled for launch in 2019 to search for ice on the Moon, is likewise being programmed in SPARK. Since October 2013 Ham YL has supported Ada Lovelace Day, which is about sharing stories of women in STEM (Scientists, Technologists Engineers, Mathematicians). What is hoped will be the first annual “Get Your Park ON” operating event, will take place October 14 – 20, in celebration of Earth Science Week. The event is open to Amateur Radio operators around the world and is sponsored by the national affiliates of World Wide Flora and Fauna (WWFF), which encourages radio amateurs to operate outdoors in protected nature parks. Amateurs can participate in one of two ways. They can opt to be Activators, setting up and operating in geological and nature centers such as national and state parks and forests, national monuments, and protected nature habitats. They may also decide to be Hunters, operating from home and searching out and making contact with the Activators. The American Geosciences Institute in October 1998 organized Earth Science Week, a national and international event to help the public gain a better understanding and appreciation for the Earth sciences and to encourage stewardship of the Earth, a common goal shared by WWFF. Both programs encourage participants to get outside and enjoy nature. Earth Science Week 2018 theme of “Earth as Inspiration” promotes public understanding and stewardship of the planet. "Get Your Park ON" begins at 00:00 UTC on Sunday 14 October and continues to 23:59 UTC on Saturday 20 October. Visit the "Get Your Park ON" Facebook page for more information. Anette Jacobs ZR6D jhjacobsza@gmail.com SARL news contributer. and at: Italian Radio Amateurs Union: QTC U.R.I. If you do not no wish to receive our emails, please let us know and we will remove you from the mailing list.